Imagine zipping through the beautiful city of Rome on a scooter, as wonderful sounds and smells fill the air. Thanks to Audrey Hepburn and Gregory Peck, Vespas are now an iconic symbol for Rome and Mediterranean transportation. 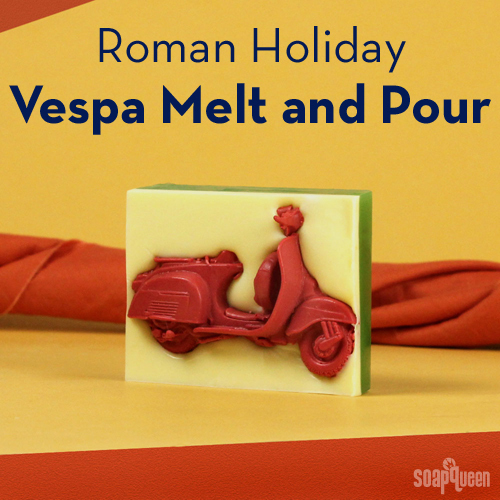 While a moped ride in Rome may not be a possibility, this moped Melt and Pour project scented with Neroli & Shea Blossom Fragrance Oil brings the sense of Roman adventure into your home. To create the scooter-shaped mold, we used Flexy Fast Molding Putty. Fast drying and easy to work with, this molding putty is perfect for creating a wide variety of mold shapes. If you’d like to see this molding putty in action, check out this Special Edition “Back to School” Soap Queen TV video! For this project we used two small containers of putty, but the amount may vary slightly depending on the size of your molding object. With Halloween “creeping” up on us, I’ve been thinking I should get a head start on my Halloween gifts. These Caramel Apple Soaps look and smell delicious. I felt like I was making real caramel apples! Let these be your Fall hostess gifts this year whether it be a Halloween Party or just a fun get together with your friends. 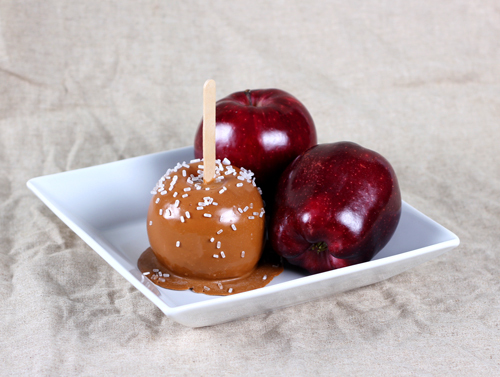 I think these would be really adorable molded from little crab apples to make mini guest-size caramel apple soaps, too. Admit It: These Soaps Rock! Get everything you need with one click! Select the “Buy It Now” icon below. TIP: If you have never used Flexy Fast, watch this episode of Soap Queen TV. It will break down the basics for you in a step by step video tutorial. And yes, you’ll be able to use the Flexy Fast mold over and over again. FIVE: While your rocks are cooling it’s time to get started on the base. I love how my color turned out. I melted 36 oz of Aloe Melt and Pour with 2 oz of Shea Melt and Pour. This gives a unique cloudy effect without being totally opaque. Then I added a couple of drops of diluted Brilliant Blue LabColor. Finally, add 1 ounce of Kentish Rain Fragrance Oil and mix well. 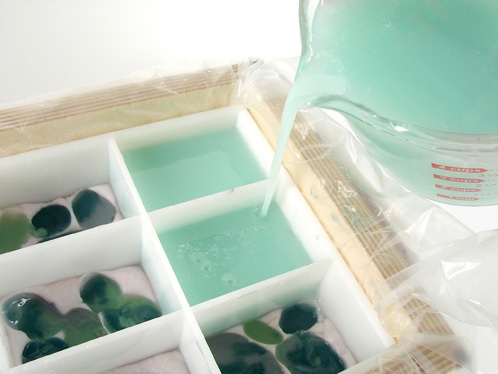 Once the soap has cooled to 125 degrees, spritz the rocks with rubbing alcohol and pour the final layer. Do you like this project? 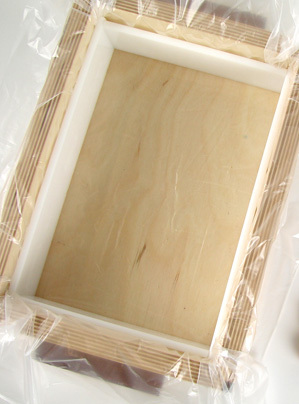 Check out another melt and pour project using the Baltic Birch Mold HERE. 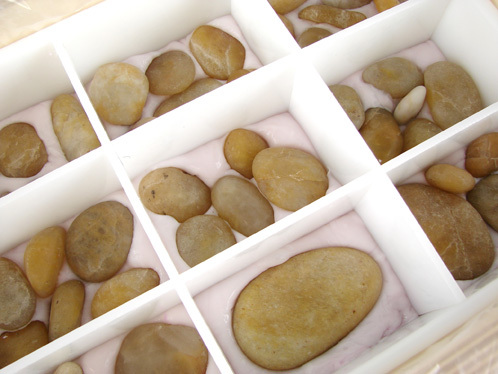 If you have never made melt and pour soap before, check out some Soap Queen TV videos to get you started. I recommend the episodes on Fragrances and Colorants. 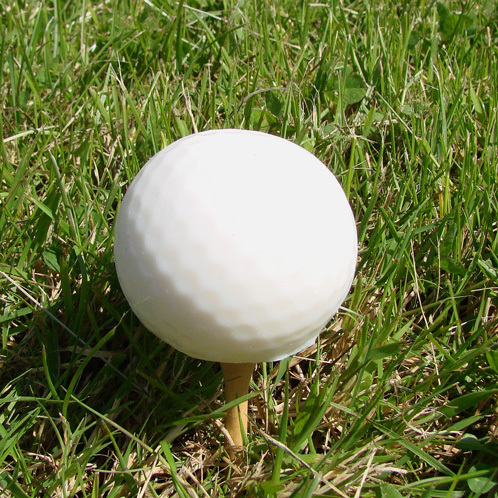 Check out other Flexy Fast projects like Golf Balls, Pumpkins, Sushi and Tips for Success. Now Dad can practice his golf swing in the shower with these soapy, mini golf balls that smell like Sweetgrass and sweet victory! Buy everything you need with here one swift click! Have you ever used our Flexy Fast Molding Putty? Check out the Soap Queen TV video tutorial HERE for basic instructions, tips and tricks. 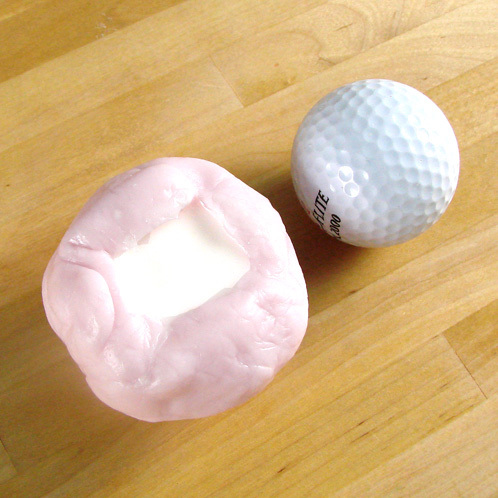 ONE: Use the single serving of Flexy Fast Molding Putty to mold 3 golf balls. Leave a little opening at the top of the golf ball so you’ll be able to pop out the soap. Once the putty has hardened and is ready to handle (this can take about 20 minutes), release the golf balls from the molds. 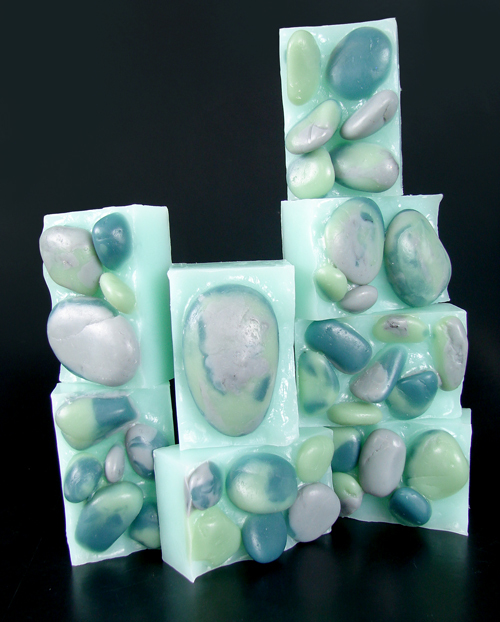 TWO: Melt 4.5 ounces of white soap base in the microwave and mix in 2 ml of Sweetgrass Fragrance Oil. 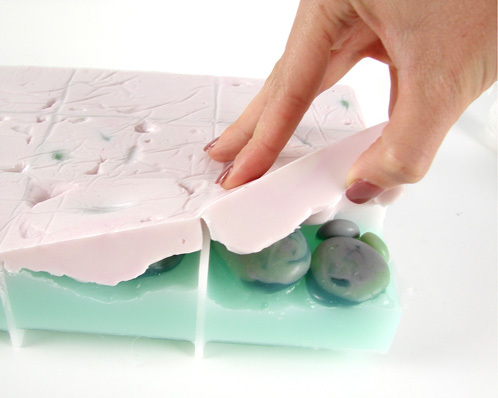 Pour the soap into each mold and let cool. THREE: Once the soap has cooled, release the soap from the mold. 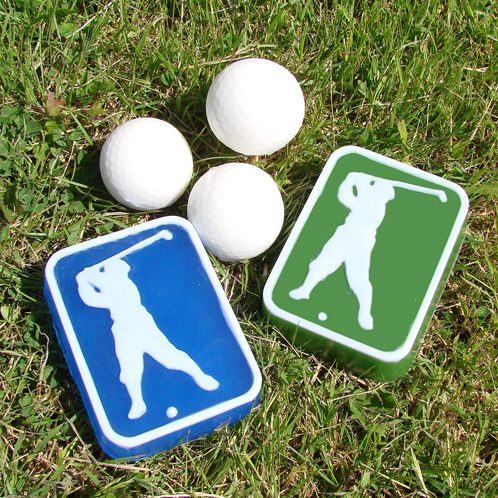 Pair these with the Golfer Soap and you have a soapy golf ensemble that’s sure to be a hole in one! Ready to try it? Get everything you need at Bramble Berry right here. Check out today’s earlier post on the Golfer Soaps, and yesterday’s post on army camo soaps. We’re totally jazzed about Flexy Fast, our new versatile silicone that makes it possible for you to make your own molds at home. Want to do a custom product for a special customer? It’s easy with Flexy Fast! Want to do a realistic texture screen? It’s easy with Flexy Fast! Soap Queen TV will be doing an episode on Flexy Fast in August but until then, here are some tips and instructions on working with Flexy Fast Silicone Molding Putty. Tip: This product is mixed by hand and wearing gloves is required. We recommend vinyl gloves, as latex gloves tend to stick to the mold putty. The photo below is using latex gloves and it was a mess! Tip 2: Pre-kneading Part A (working in your hands for one minute prior to mixing with Part B) will make the two components easier to mix. Step 2: Measure an amount of Part A approximately equal to the size of a golf ball onto the palm of your hand and create an indentation. Squeeze an amount of Part B approximately equal to the size of a small marble into the center of the Part A indentation. (Hint: It is better to start out with less Part B and add more if needed, rather than too much Part B). Step 3: Fold the Part A around the Part B and knead aggressively with thumb and forefinger. Continue folding until a uniform light-pink color is attained. Make sure that all color streaks have been eliminated. Getting a thin layer formed is easiest with a rolling pin and the thinner you can make your putty, the less money you have to spend on your mold. Step 4: Flexy Fast can be applied directly onto almost any model surface (see preparation above) except skin. After mixing Parts A & B as directed above, flatten mixture and gently press into model detail. Spread evenly over model surface, maintaining about a 3/8” (1 cm) thickness. Mix and apply more as needed, connecting and smoothing seams of different batches together. Because no two applications are quite the same, a small test application to determine suitability for your project is recommended if performance of this material is in question. In this case, I did one side as a seaweed kelp sheet and the other side with bubble wrap for a fun texture sheet. Be Careful: If your original is made of modeling clay or other soft material, pressing putty onto model surface may affect model detail. 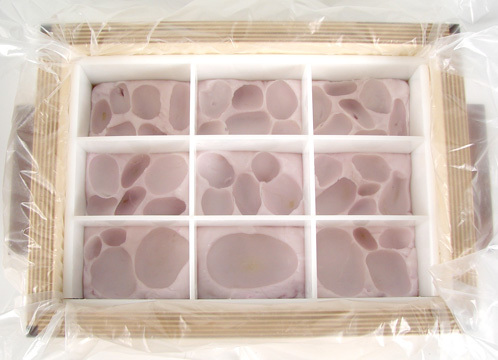 Curing: Allow the mold to cure 20 minutes at room temperature (77°F/25°C) before removing from model surface. Adding more Part B can reduce cure time. Adding less Part B will give you a longer working time and lengthen demold time. If applying a support shell, apply the shell before removing the rubber mold from the model. Using The Mold: When first made, silicone rubber molds exhibit natural release characteristics. Depending on what is being cast into the mold, mold lubricity may be depleted over time and parts will begin to stick. No release agent is necessary when casting wax or gypsum. Applying a release agent prior to casting polyester, polyurethane and epoxy resins is recommended to prevent mold degradation. 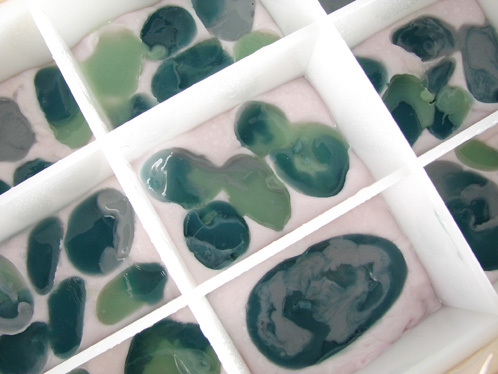 Fun Fact: ‘Let’s Get Soapy’ latest special edition eZine covers how to make handmade texture sheets and more uses for molding putty.Check in later this week on what I did with the seaweed sheet mold and learn how to make sushi soap!